To maintain a clean diet that supports your wellness and weight goals, keeping key pantry and freezer items handy helps you turn fresh foods into healthy dinners, fast. The goal is to make grocery choices that make it simple to eat smart, with a few ingredients that can serve as “go-to” basics for wholesome meals without much fuss. Spring cleaning? Don’t ignore your pantry! To stock up on clean food that tastes great, start with these four items. The benefits of a diet rich in olive oil came to the attention of the world due to the healthy results associated with what’s known as the Mediterranean Diet – a nod to the eating styles traditionally found in Greece, Italy, Spain and other countries where olives and olive oil are a main staple of the daily diet. Its list of benefits is long and impressive, ranging from lowering risk of heart disease and depression to improving skin and digestive health. Seems there are very few reasons not to enjoy a good-quality extra virgin olive oil on a regular basis—so be sure to always have some on hand. It’s delicious way to marinade your meats, dress your salads and roast your veggies. You don’t need access to pricey fresh fish to enjoy the many nutrition benefits of salmon, including being a great source of protein, thiamin, niacin, vitamin D, potassium, and vitamins B6 and B12. For the most bang for your buck, choose canned salmon or frozen wild Atlantic salmon filets (go for U.S. sources and avoid farm raised). Salmon is one of the top sources of the very healthy fats known as Omega-3 fatty acids. 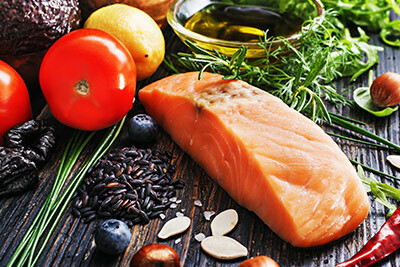 Omega-3s are known to offset blood vessel inflammation and to help keep platelets from sticking together— important actions for reducing the chance of heart attack and heart rhythm abnormalities. The American Heart Association suggests eating fatty fish like salmon twice a week. You can cook it up quickly with a bit of olive oil. Try it as a salad topper this spring! This ancient grain (technically, it’s a seed) shot to modern popularity a few years ago. Because of its nutritional value, it deserves an honored place in your eating plan from now on. We suggest setting your quinoa next to the rice in your pantry so you’ll have a nourishing choice when you’re searching for a starchy side dish. In fact, while white rice and quinoa offer similar grams of carbohydrates per serving (about 20), quinoa provides five more grams of fiber plus twice the protein. Quinoa marries well with the seasonal veggies and grilled favorites of spring and summer (like that salmon we just mentioned). Not only will it add protein, amino acids and fiber to your meal, you’ll be done cooking it in about 15 minutes. Store your cooked quinoa for more uses, like lunch salads, all week long. Did you know that as far back as 400 B.C., the Greek physician Hippocrates prescribed garlic for conditions ranging from parasites to fatigue? Today we know garlic helps support the respiratory, immune and vascular systems. In fact, the National Institutes of Health contends research on garlic in the diet has shown benefit for prevention of hardening of the arteries, lowering the risk of some cancers, and more. Happily, buying, keeping and using garlic is super simple–fresh garlic bulbs are inexpensive and store easily in a cool dark place like your pantry. Cooking with garlic works for nearly every flavor profile, too. You can access its medicinal properties by mincing it into a salad dressing with olive oil, or using it in a marinade for your salmon.